Storing onions for 3-9 months over the winter requires keeping them dry (but ideally at 60-70% humidity) and well-ventilated, which helps prevent fungus. Never try to store even slightly damaged onion bulbs. For best results, eat any damaged onions right away, using only unblemished, full bulbs with thin necks for winter storage. If onions have thick necks they won't dry properly, which can lead to fungus. Don’t pile dried onions up, or any fungus on even one bad one will end up spoiling the whole batch. Orchard drawers are banks of drawers in open-sided frames that provide excellent ventilation. They can have wooden-slat or wire-mesh drawer bottoms, but not solid. They can be used for onions, garlic, potatoes and winter squash, and I think they look lovely when filled with summer's goodness. They are both beautiful and practical. Gardener's Supply now sells these wonderful little orchard racks with either 6 or 9 wood-slat storage drawers. 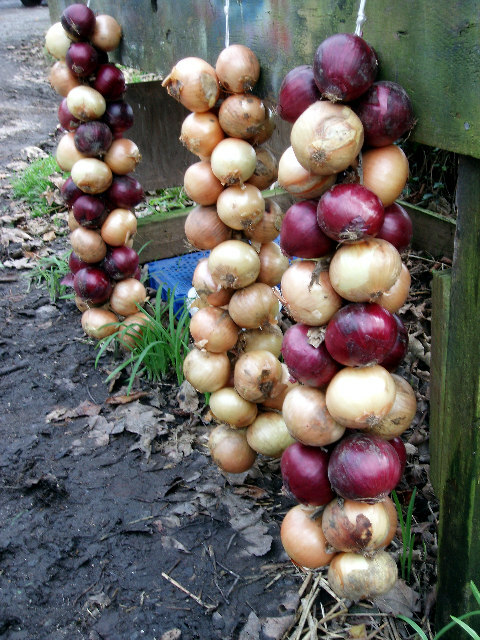 A low-cost way of storing lots of onions is to string them, like in the photo at the top. 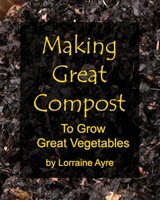 It's ridiculously easy and fast, costs nothing, and is great for larger quantities of onions. Take a 6-foot-long piece of very strong string (baling twine or nylon is good). Tie the ends together so you have a big loop. Hang the loop from a well anchored hook or nail someplace, and pull the bottom tight so that you essentially have a double 3-foot string. Starting with your largest onion, break the stalk off about 6" from the onion bulb. Holding the onion with the bulb up and the stalk down, weave the stem back and forth between the two strings, twice. Now pull the onion down over the weave and down to the bottom of the string. The onion will be hooked on there quite well. Take another onion and weave it on the string above the first. You can repeat this with as many onions as your string can hold. Put the larger onions at the base and the smaller ones toward the top. Trim a bit more off the stems if you want. If your onion strings are heavy, make sure what you hang them from is well secured! Another clever way to store onions is in pantyhose! Seriously! It’s time consuming if you have a lot of onions to store, but for only a few dozen, you can pick up pantyhose for cheap at the thrift store. Drop an onion in the leg, close it off with a bread bag tag or twisty tie, drop another onion, and so on. You can hang these from the ceiling and they stay well-aired, separated from each other, and they look cool in their own weird way! You can also store onions by simply braiding them into clusters of 8-12 onions. Tie them off at the top, and hang them.